Recently the PCA Historical Center was able to add to its research library a copy of THE SCHOOL & FAMILY CATECHIST, by Rev. William Smith, A.M. According to WorldCat, just three other institutions of record hold copies of this title. An acquaintance with the principles of our holy religion is a matter of high importance, both to our present happiness, and to our future welfare. It is always in a religious community that the best members of society are to be found, whether man be contemplated in the capacity of a magistrate, or of a subject, as filling the higher, or as occupying the more subordinate stations of human life. In those countries where true religion is unknown, or, which amounts to nearly the same thing, where it has little or no hold upon the minds of the people at large, crimes the most shocking, and the most revolting to humanity, are perpetrated without remorse. If then, a religious education be highly advantageous to us, even as members of civil society, and as beings appointed to act a part on the stage of time, how does it rise in importance, when we consider that it is essentially necessary, and indispensable, to our preparation for eternity, and for entering upon that state of being, in which our everlasting happiness or misery shall, as we are assured, greatly depend upon the habits we have formed in the present life. If we be desirous of reaping the proper fruit, let us take care that the soil be well cultivated, and the seed sowed in due time. If we are anxious, that our children should act their part in life in such a manner as to promote their comfort and respectability here, and their eternal happiness hereafter, let us be careful to have their minds stored, as early as possible, with sentiments of religion and of virtue. This is the only sure foundation that we can lay for their future usefulness and comfort in life, and for their welfare in another world. If a religious education is thus important, it must then be evident, that an acquaintance with the principles of religion is indispensably necessary, since without this no real progress can be made in spiritual knowledge. Hence the evident utility of those publications in which these princples are laid down clearly and distinctly, divested of all extraneous matter. 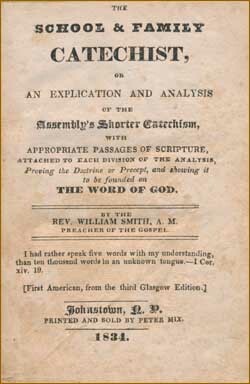 Smith’s approach is similar to that of Fisher in his Catechism, where additional questions and answers are added to explain and expound those found in the Westminster Shorter Catechism. Rev. Smith however is careful to note that his approach is to remain succinct and to keep the whole work short, thus the more likely to be used with some profit. Ans. Man’s chief end is to glorify God, and to enjoy him for ever. Chief end.—The principle purpose or design for which man was made, and to which he should, above all things, labor to attain. To glorify God.—To do honor to his name, by loving him, and trusting in him, believing his word, and keeping his commandments. To enjoy him for ever.—To have God’s favor, and the influences of his Spirit in this world, and to share in the happiness of his immediate presence in heaven hereafter. 1. To glorify God.—1 Cor. x. 31. Whether therefore ye eat or drink, or whatsoever ye do, do all to the glory of God. 2. To enjoy God.—Psalm lxxiii. 25, 26. Whom have I in heaven but thee, and there is none upon earth that I desire beside thee.—God is the strength of my heart and my portion for ever. The Scriptures.—The writings, or books of the Old and New Testaments, so called, by way of eminence, on account of their great importance. To direct.—To point out the proper method. 1. The necessity of a rule to direct us in glorifying God.—Acts ii. 37. They said unto Peter and the rest of the Apostles, Men and brethren, what shall we do? 2. That the Word of God is this rule.—2 Tim. iii. 16. All Scripture is given by inspiration of God, and is profitable for doctrine, for reproof, for correction, for instruction in righteousness. 3. That the Scriptures of the Old and New Testaments are the Word of God.—Eph. ii. 20. And are built upon the foundation of the Apostles and Prophets, Jesus Christ himself being the chief corner-stone. 4. That the Word of God is the only rule given to direct us how to glorify and enjoy him.—Isa. viii. 20. To the law and to the testimony : if they speak not according to this word, it is because there is no light in them. This is great! Do you know where we can get more of it–that is, do you know whether it is available electronically somewhere? If it is not, are you willing and able to make more of it available electronically? How can I get a copy of this volume? This is certainly a rare book, and it appears to have some real value for the Church, even today. Please pray with us as we consider how we might make it available.